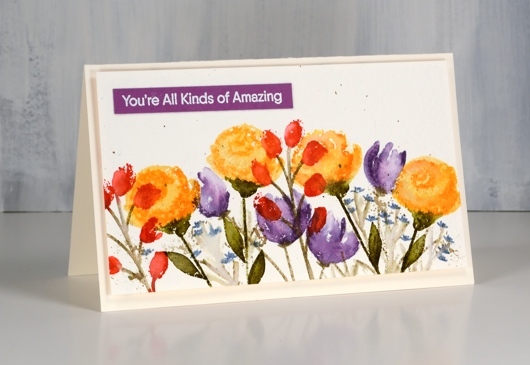 To create this card I worked with a bold red, orange and purple palette on rough watercolour paper with distress ink pads, a little different to the blues, pinks and hot pressed choices I often make. The stamps are from the Painted Prints layering set from My Favorite Things. I started by stamping the roses in scattered straw with the second layer in spiced marmalade. After stamping I blended with a wet paint brush. 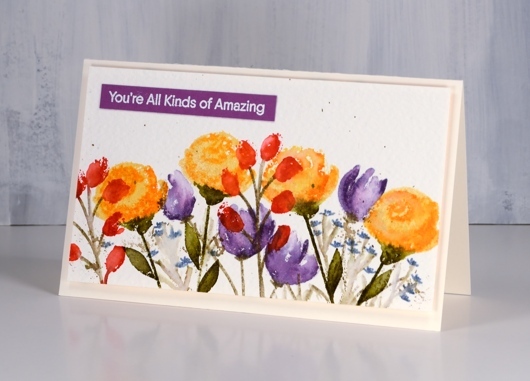 Next I popped in the purple flowers stamping off with dusty concord for the first layer then using the same ink at full strength for the second layer. The red flowers I used only the second layer stamp with festive berries ink. The stems or leaves are either forest moss or frayed burlap, stamped then blended with some water. I used a tiny stamp, which I think is for sepals or maybe flower centres, to stamp little flowers in stormy sky ink. I also splattered a little frayed burlap ink over the panel; you know I like a little splatter here and there. The floral panel is popped up on a piece of orange adhesive backed foam and attached to a cream base. 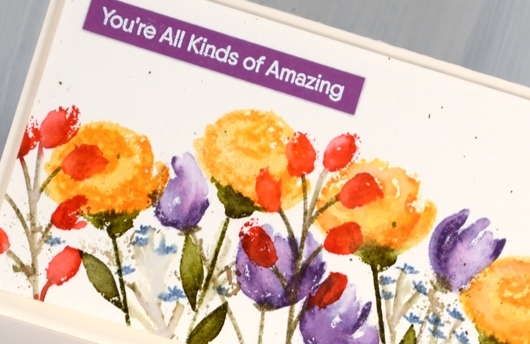 To finish off the card I embossed a sentiment from Anything but basic Friendship set on a strip of purple cardstock in opaque white powder. Wow, Heather I love the colours on this very vibrant design. Smashing choice of sentiment too. I don’t usually like layered stamps, but you have done an awesome job with these, Heather! You are tempting me!!! That’s beautiful, Heather! I love your design and the vibrant colors you chose. Beautiful! Love the wonderful colors & design!